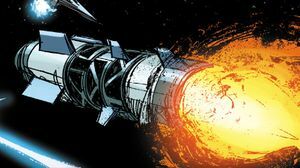 The Shiva-class nuclear missile is the most commonly used starship- and starfighter- launched thermonuclear weapon used by the United Nations Space Command. The Shiva can be outfitted with various payloads and explosive yields. These missiles are often employed by the UNSC in ship-to-ship engagements with the Covenant. UNSC forces only use nuclear weapons, such as the Shiva, when human forces are severely outnumbered, and/or tactical situations that demand the use of such weapons. The Shiva missile is carried and used on most warships in the UNSC. The Shiva is stored in a ship's nuclear storage bay until it is time for it to be deployed. Once launched from the ship, its onboard guidance system will guide the warhead to its intended target. However, the warhead's course can be corrected mid-flight by the ship's navigation officer or artificial intelligence. The warhead can also be fitted on Longsword interceptors for low-profile insertion. The Shiva can be detonated by two methods: radio transmission code sequence, or a proximity fuse, whichever method is most effective for the situation. Space-based weapons are preferred in combat situations with the Covenant because of the massive electromagnetic pulse released by such warheads like the Shiva; this is most effective for disabling electronics aboard nearby enemy ships; this was done by SPARTAN-II Gray Team during the Battle of the Rubble. Covenant capital ships have enough power to absorb a full Shiva blast from long distances, and in some cases direct hits. If the warhead detonates inside the shield, the effects of the blast is multiplied tremendously: the ship's shields would briefly contain the explosion, redirecting the blast's energy back into the ship. This was demonstrated in the Fall of Reach by Captain Jacob Keyes while commanding the UNSC Pillar of Autumn. Sahara-class heavy prowlers are armed with M947 Shiva nuclear delivery systems. Shiva is the name of the Hindu god of both disaster and peace, who would destroy the world in order for it to be recreated. The UNSC Commonwealth launches a Shiva-class nuclear missile at Unrelenting. ↑ Halo: The Fall of Reach, page ?? ?